Sitting just outside the town of Lijiang, in China’s southwestern corner, is Jade Dragon Snow Mountain. On one side of the mountain is one of the region’s most popular destinations, Yulong Snow Mountain Scenic Area, one of China’s AAAAA-classified scenic areas. 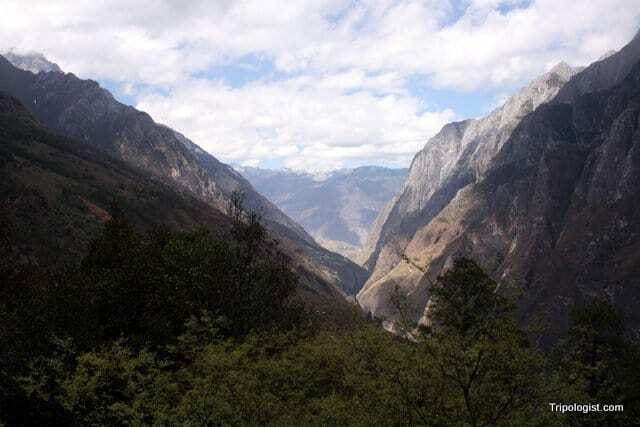 On the other side of the mountain is another one of the area’s popular attractions, Tiger Leaping Gorge. Spanning 15 kilometers in length, the gorge is one of the world’s largest and most beautiful sites. With Jade Dragon Snow Mountain towering on the southern side and Haba Snow Mountain to the north, the Jinsha River roars at the bottom of the 2000-meter deep gorge. For visitors, the best way to see the gorge is by taking the 20-kilometer hike along the northern ridge of the gorge. Spanning some of Yunnan Province’s most spectacular scenery, the hike is a must do for nature lovers. Starting from Lijiang, one of China’s most beautiful towns, most hotels and hostels can hook you up with transportation to the trailhead, just outside of Qiaotou. After paying the admission charge of 65 CNY (25 CNY for students), the bus drops its passengers off at the start of the trail. At first, the trail climbs through fields and past several temples before reaching the mountain ridge with a view of the river below. As you continue along the trail, the views become more and more beautiful. Looking down at the raging river below, with the snow-capped mountains above you, it’s hard to believe you are in a country with such a terrible environmental record. The views along the trail are breathtaking, but the hike can be very tiring because you have to carry all your things. As you hike the trail, you’ll have continuous views of the river as much as 2,000 meters below and the mountains high above. The trail winds its way along the ridge line, occasionally becoming treacherously narrow. During the hike, we passed through fields, small Naxi villages, and even forests. It is worth noting that the trail could be potential dangerous during bad weather. The trail was narrow in places, and there was even a waterfall that cross the trail at one point, an issue if heavy rain had recently occurred. There is also a risk of landslide, and we had to cross an area where the trail had become covered with debris. While the trail is safe during good weather, it will certainly require extra care during poor conditions. Along the trail, you’ll find several enterprising locals who sell food and drinks. Unfortunately, you’ll also find some less scrupulous locals who will try to charge you to stand on the more scenic rocks or highest points. Fortunately, though, they are fairly easy to avoid. On the plus side, though, there are several guesthouses and restaurants that charge reasonable rates and offer good quality. 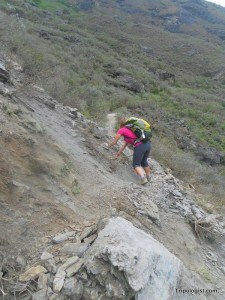 The trail can be treacherous due to rockslides and heavy rain. Make sure to use caution when hiking. While it is possible to hike the trail in a day, nearly everyone does it as a two day hike. Most people break up their hike by stopping at Halfway Lodge, approximately six hours from the trailhead. The lodge is set in a beautiful small village and the view from the bathroom is stunning. When my wife and I did the hike, however, we opted to stop at the Tea-Horse Trade Guesthouse, about a five-hour hike from the start of the trail. We opted to do this because of the beauty of the hotel’s location and because we wanted a chance to relax and enjoy the view before sunset. Our room was nice, with a wonderful balcony and an acceptable bathroom. From our guesthouse, it was a 3.5 hour hike to Tina’s Guesthouse, where buses are available for trips back to Lijiang. If you arrive with several hours to spare, head down the trail to the river below, where you can get a close look at the raging rapids. The trek down the gorge is quite arduous, so make sure you have the time and energy to complete the journey. 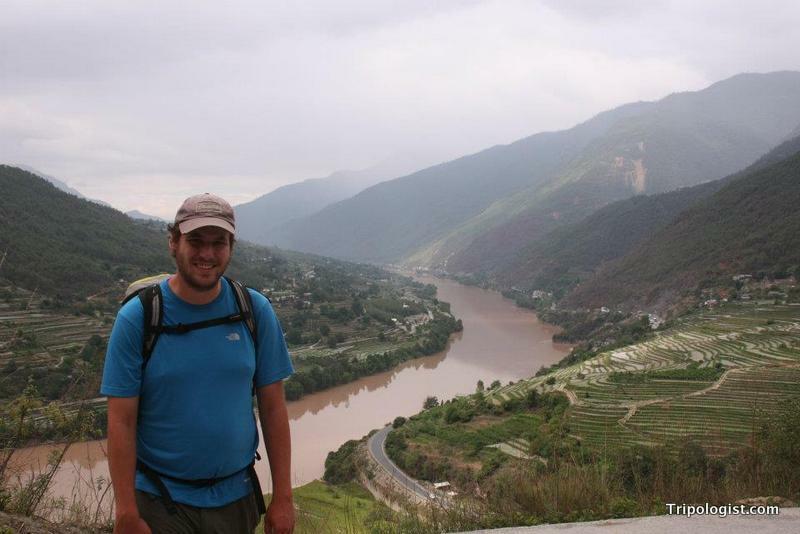 Overall, I would say that Tiger Leaping Gorge is a must do hike for anyone visiting southwestern China. It is easily one of the most beautiful places I’ve ever had the privilege of seeing. You do have to be careful. I hurt my knee on the decent, though on a good part of the trail. However, it was definitely worth hobbling around for a few weeks to see the gorge.